With this frigid weather we’ve been having lately, it seemed like a good time to introduce the chickadee children to an investigation of ice. It’s easy to underestimate the powerful learning that can happen when children are encouraged to wonder more deeply about the properties of something in their everyday experience. All the children have had previous experience with ice and cold. What would they wonder about if we put out a few ice blocks? Would they notice the crystals and bubbles that formed as the ice hardened? Would they notice changes in the ice blocks over time as the ice melted, and would they have the language to describe those changes? Would they be interested in sliding the ice across the galvanized steel tabletop tray we offered, and would they notice the water droplets, and then puddles, that formed paths as the ice moved across the tray? For most children, their first investigation at the ice table was a tentative one. “What’s this?” “It’s ice!” “It’s cold!” Fingertips touched, pulled away quickly and then touched again. When a teacher suggested rubbing hands and fingers together to keep warm, a game of touching ice and then rubbing hands together, giggling, quickly developed. A few children returned to the table multiple times through the day, and then through the week. Some brought magnifiers to see crystals more closely. One child noticed that when he tried to push the ice it was stuck to the tray at first. When it melted a bit it was easy to slide. He came to the table often, trying to push the pieces of ice faster and faster across the tray as the ice melted. As the children noticed the ice melting, many asked, “What happened to the ice?” In these moments teachers repeat the question rather than answering it. It’s the process of exploration and wondering that leads children to their own discoveries, and having an answer is often less important than that process. What did happen to the ice? Children said, “The ice is disappearing!” A few children clarified for others that the ice was melting (they had the word) but many did not. Instead, noticing the disappearing ice, children put their fingers first on the ice, and then on the deepening puddles of water next to the ice. What’s going on here? It was a surprise to teachers that the most intriguing question that children investigated this week came from one child’s interest in warming the ice. 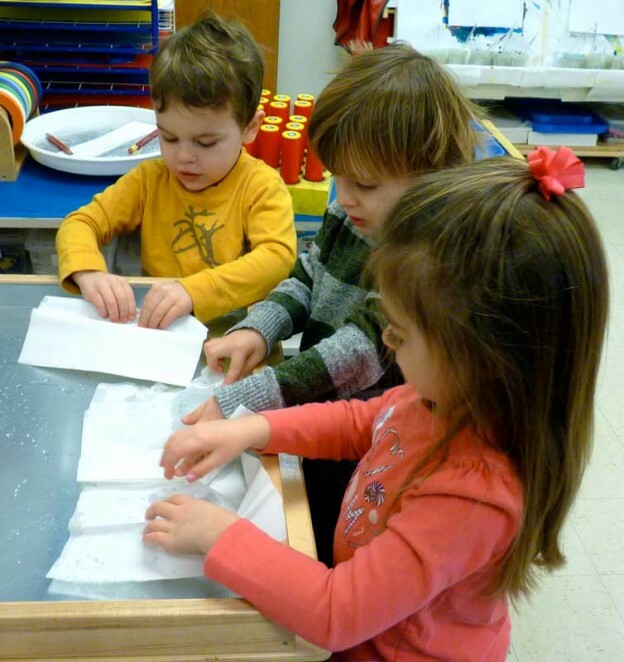 “The ice is too cold – how can we warm it?” Teachers simply said, “I wonder”. She decided that putting a paper towel on the ice should warm it (after all, going under a blanket warms us doesn’t it?) This began a weeklong investigation involving many children as they placed paper towels on ice, found that some got wet, others stuck to the ice, and none really warmed it up. What’s going on here? This entry was posted in Chickadees, Curriculum, Education, Philosophy, Project and tagged chickadee, children, curriculum, education, learning, preschool, project, science on January 11, 2015 by Katrina Selawsky.